For professional photographers and advanced hobbyists, digital single lens reflex (DSLR) cameras are the way to go. They offer faster performance, more control over settings, and better image quality than top-of-the-line point-and-shoot cameras. Most importantly, they give you the ability to switch lenses. Thanks to recent innovations, DSLRs and compact interchangeable lens cameras (also known as compact system cameras) are growing in popularity with the hobbyist and enthusiast crowd. Many DSLRs now feature preset shooting modes, friendly interfaces, helpful guides, and more compact designs. Mirrorless interchangeable lens cameras are proliferating and growing more popular than ever with their lightweight, sleek, stylish looks and advanced functionality. While you can find consumer DSLR and interchangeable lens cameras for well under $1,000, they are a considerable investment. How do you choose the right one? We've got some tips on shopping for a DSLR or interchangeable lens camera if you're in the market for one this holiday season. Here are a few key points to consider before shopping. The megapixel myth: A high megapixel count doesn't mean better image quality. However, it does give you more flexibility when cropping or making enlargements. These days most cameras offer a resolution of at least 10 megapixels, which is overkill for most shooters. A 5-megapixel image is enough to make a sharp 8-by-10 print. An 8-megapixel image is enough to make a sharp 11-by-14 print. A 10-megapixel file can produce acceptable prints of up to 13-by-19 inches, though they may lose some detail. Images from a 13-megapixel camera look good at 13-by-19 inches and can be pushed to 16-by-24 inches. Many DSLR cameras today exceed 13 megapixels--all the better to creatively zoom in and crop your images. Keep in mind that higher megapixel counts also produce larger files, which in turn take up more space on your camera's memory card and computer's hard drive. Pay attention to sensor size: Cameras with larger sensors and better lenses normally take better shots, regardless of megapixel count. Bigger sensors normally create better images, as do higher-quality lenses; this is why DSLRs take such stunning photos. If you can't get any hands-on time with a camera before deciding whether to buy it, make sure to check the specs to see its sensor size, and compare it with any other camera you are considering purchasing. Typical terms you'll run into when examining camera sensor types are CCD (charged coupled device) and CMOS (complementary metal-oxide semiconductor). When considering sensor size, you'll confront terms like Four-thirds and Micro four-thirds, APS-C, full-frame, and more. Large sensors are not confined to interchangeable lens cameras anymore, either. Sony, Nikon, and Canon have all come out with large sensor fixed lens cameras, too. Be practical: DSLR prices range from $500 to well beyond $1,000. If you're new to DSLRs, look for a camera in the sub-$1,000 range. They'll have preset shooting modes you can use while you learn how to master the manual settings, and you won't sacrifice much in terms of image quality. And, if you do decide to upgrade to a more expensive camera body later, you can buy a camera that takes the same lenses and accessories. Body only: Many DSLRs can be purchased body-only and require that you supply a compatible lens in order to take photos. Others--especially entry-level models--also ship as part of a kit that includes a decent-quality multipurpose lens. Kit lenses tend to be relatively slow, meaning you may have trouble getting sharp action shots in low-light situations without a flash. If you tend to shoot indoors, you may want to consider also investing in a faster lens. Once you've settled on basics like the number of megapixels and the size of the sensor, you should have narrowed your search to a more manageable number of cameras. From this point on, you should base your decision on features and performance. Here are some important ones to consider. Image stabilization: Even if you think you have rock-steady hands, it's easy to end up with blurry photos--particularly in low-light, indoor environments where you don't want to use a flash (in a church or a museum, for example). In these situations, the shutter has to stay open longer in order to create a good exposure. And the longer it stays open, the more susceptible your image is to the effects of camera shake or subject movement. Optical Stabilization Used in compact cameras and DSLRs, optical stabilization is the most common image-stabilization method. Optical stabilization uses gyroscopes within the camera or the camera's lens to detect camera shake, and then steadies the path of the image as it makes its way to the camera's sensor. In DSLRs, the gyroscopes are often located in the lens. Sensor Stabilization This technology works similarly to optical stabilization. With sensor stabilization, gyroscopes located in the camera body, rather than the lens, detect shake and then move the image sensor to counteract the motion. Although it's available on some point-and-shoots, sensor stabilization is more commonly used in DSLRs. Digital Stabilization Unlike optical and sensor stabilization, which actually correct the image while you're capturing a picture, digital stabilization attempts to make a picture clearer by simply changing the camera's settings or by altering the image after it has been captured. There are several approaches to digital stabilization. One of the most useful is Intelligent ISO. Used primarily in compact cameras, an Intelligent ISO feature automatically increases the ISO, or light sensitivity setting when the image sensor detects a moving object. As a result, the camera is able to use a faster shutter speed to snap a picture, thus freezing the motion of the subject and reducing blur. A high ISO can, however, make images more noisy. Viewfinders Cameras come with three basic types of viewfinders: Optical viewfinder (OVF), electronic viewfinder (EVF), and an LCD screen with Live View. The first two are both eye-level viewfinders, while the third lets you preview a scene on the camera's LCD screen. Most current DSLRs have an LCD screen in addition to an eye-level viewfinder. When evaluating a camera, make sure its viewfinder is bright, that you can see from edge to edge, and that the focusing screen is clear. LCD with Live View Live View on an adjustable LCD screen is a great feature for any time when you need to shoot over your head, down low, or in other situations where your camera position makes looking through the viewfinder impossible. If an LCD screen isn't adjustable, Live View still makes for more relaxed tripod-mounted shooting. Unfortunately, LCD screens can have reflections and glare, making them difficult to see in bright light. Also, during Live View mode on most cameras, the SLR must flip up its mirror. That means the camera loses its autofocus capability. To calculate focus, it has to analyze the image that it's seeing (Sony's translucent mirror technology solves this problem). This takes much longer than normal autofocus, so when working with Live View you'll need to anticipate your focus concerns and adjust your shooting technique accordingly. Optical Viewfinder Optical viewfinders on DLSRs show exactly what the lens sees, but often with a small amount of cropping around the edges. They are the preferred choice for many pro photographers as they have all the dynamic range of the human eye, and no lag time. They can sometimes feel like you're looking through a tunnel, though. The optical viewfinders on more expensive (over $1,000) cameras are better quality. Electronic viewfinder Found on many of the compact interchangeable lens cameras, these viewfinders take up less space in a camera, which mean a smaller and lighter body. They are projected video feeds, and as such can have low resolutions. They also don't show you the full dynamic range of the scene, making it harder to make creative decisions about how you want to expose your shot. They also have a slight lag time which can be a deal breaker for sports photographers. What they can do is overlay more information and show a preview of what an image will look like with your chosen aperture, shutter speed, and ISO settings. For a more expansive look at the pros and cons of optical and electronic viewfinders, check out this comparison. Flash When buying a camera, you'll want to know what type of flash it has and how much control it gives you over flash settings. Some DLSRs have a small built-in flash, some have a hot shoe mount--a bracket that lets you attach an external flash to the camera, and some cameras have both. If a camera has a mount but no flash, check to see if an external flash is included as part of the kit or if you'll need to buy it separately. A built-in flash is extremely handy to have, but it's not going to be as high of quality as an external flash. If you plan on using a DLSR camera for casual photography or if traveling light is important to you, a built-in flash will be useful. If you're an advanced photographer who wants to greatly improve the quality of your flash photography--and aren't concerned about the heft of the camera--take a hint from the pros and choose a camera with a hot-shoe mount. This way you can attach external flashes, which throw light wider and farther than built-in flashes can, producing more-consistent light. They also raise the flash head above the lens, which helps reduce red-eye. (Forget about using a camera's red-eye mode for this--it'll be more annoying than useful.) Some external flashes even have rotating heads that let you bounce the light off of ceilings for a diffused, natural look. Finally, external flashes don't drain your camera's batteries, as they run on their own battery source. Make sure the camera you buy gives you quick access to different flash modes, including On (which forces the flash to fire even if the camera detects enough light--useful for back-lighting situations), Off (to prevent your flash from firing even in low-light situations), and Slow-Sync (which is also sometimes referred to as Nighttime mode). This last mode is particularly useful as it tells your camera to use a slow shutter speed in combination with the flash, thereby preventing background detail from getting washed out. If you don't find this mode in the Flash settings, take a look at the camera's preprogammed modes. Some cameras also include a nifty Flash Exposure Lock (FE Lock) feature. This lets you tell the camera what the most important aspect of the scene is and then provides just enough flash to illuminate it. Autofocus While shopping you'll read a lot about different autofocus systems. The most common thing you'll find is that some systems have more "points" than others. This simply means that they can detect a subject in more parts of the frame. More points are better, but the speed of the autofocus mechanism is equally important. Also, DSLRs don't have the shutter lag that many point and shoot cameras have. Still, focusing a DSLR requires pressing the shutter button halfway and can take varying amounts of time on different cameras. If you can get a hands-on experience with a DSLR before you buy, check the autofocus speed. Continuous autofocus is a handy feature if you are photographing moving subjects. Some new DSLRs now offer continuous autofocus while shooting video. This is a great feature, but if you're shooting without an external microphone, your video might pick up the sounds of the lens refocusing. Size A full-size DSLR is larger and heavier than other camera types, so comfort is key. A camera that fits comfortably in one person's hand may be too large or small in someone else's. If size and weight are a serious concern, you may want to consider a compact interchangeable lens camera, which have bodies as small as point-and-shoot cameras. Dust buster If you think you'll be changing lenses often, look for a DSLR with an internal sensor cleaner. This helps keep your image sensor clean and dust free. If you're using your camera in rugged, outdoor conditions you may still need to manually clean your camera. File formats DSLRs support raw file formats, which are un-processed files. Raw files offer the most editing flexibility when you open the photo in an image-editing program. However, if the camera is still relatively new, keep in mind that you may need to wait for editing programs from third-parties, such as Adobe and Apple, to support the camera's raw format. DSLRs also support the JPEG format, which all image editors can read, no matter what type of camera takes the image. JPEG uses compression to create smaller file sizes that won't take up as much storage space as raw files, but do not have as good image quality. Continuous shooting mode If you take photos of sporting events, kids, or any other fast, unpredictable subject, a continuous-shooting (or burst) mode will make a huge difference in your photography. This mode lets you hold down the shutter button to shoot multiple photos in rapid succession. The number of pictures you can record in one burst is determined by your camera's electronics--and in some cases by the type of memory card you have. You may need a more high-speed memory card to take advantage of your camera's fastest shooting rate. If so, be sure to factor that cost into your decision. To be effective, a continuous shooting mode should capture images at least 3 fps (frames per second) or faster at the camera's highest resolution. Face Detection With this mode turned on, your camera locates the people in a shot and then fine-tunes the focus and exposure for those faces. While this may sound like a superficial gimmick, we've found that it works surprisingly well--greatly increasing your chances of getting good shots at a wedding or family reunion. Typically, this option is in the camera's autofocusing (AF) menu. Face detection is particularly handy for candid shots, where you're working quickly and are thus more vulnerable to misfocused shots. It's also a boon for flash photography. With face detection turned on, the flash doesn't try to illuminate the whole room, just the people within range--cutting down on the nuclear blast effect. Storage If you have an existing storage card that you'd like to use with your new camera, make sure that it's compatible with your new purchase. Most cameras on the market today use SD (Secure Digital) or SDHC (Secure Digital High Capacity) format cards. SDHC (Secure Digital High Capacity) cards are more expensive, offering increased storage capacity up to 32GB, but they're not backward-compatible with standard SD slots. SDXC, which supports storage capacities up to a whopping 2TB, are even more expensive and they aren't compatible with all SD/SDHC card slots. Video Many DLSRs offer video recording features--often at HD resolution. You'll have to make some usability compromises that you wouldn't have to make if you used a camcorder but the video quality is often worth it. And because you can take advantage of a variety of lenses, including fish-eye lenses, you can achieve interesting video effects with an SLR. Remember that video requires a lot of storage space, so plan accordingly. In addition to storage capacity, there's also the speed issue to consider. SD and SDHC cards have a Decoding Class rating listed, which refers to the data-writing rate for each card. The higher the Class number, the faster the write speed; if you're planning on shooting video or using a high-speed burst mode, look for a Class 4 or Class 6 card at the very least. To complicate matters further, there are a couple of other card formats out there. Some cameras support MicroSD or MicroSDHC cards, a smaller version of the SD card format that isn't compatible with full-size SD slots. Older Sony cameras take MemoryStick cards, and older Olympus cameras use the XD card format; both companies' new cameras now support SD/SDHC cards. What's more, many higher-end DSLRs have a larger-format CompactFlash card slot. You'll want to consider all of these options when purchasing storage for your camera, though it is definitely easiest to go with standard SD/SDHC cards since you will be able to use them across cameras. Battery life Cameras use one or more of several types of batteries: AAs, either non-rechargeable alkaline ($5 for four) or rechargeable nickel metal hydride (NiMH, about $14 for four); high-capacity disposable CRV3s (around $10 apiece, and some cameras take two); or proprietary rechargeable batteries that can cost $25 to $65 to replace. Some digital cameras quickly drain batteries--especially alkaline batteries--which can be expensive and annoying. Battery life and cost often aren't related; some inexpensive cameras have great battery life, and some expensive ones use up a charge quickly. Either way, it's a very good idea to buy spare batteries. Menus When evaluating a camera, consider how easily you can reach common settings--resolution, macro mode, flash, and exposure adjustments--and how easily you can play back just-taken images. Too many buttons, and you waste time trying to figure out which button does what; too many menus, and you waste time digging through them. Compact interchangeable lens cameras These cameras are part of a newer product category that sits between true DSLRs and advanced point-and-shoots. 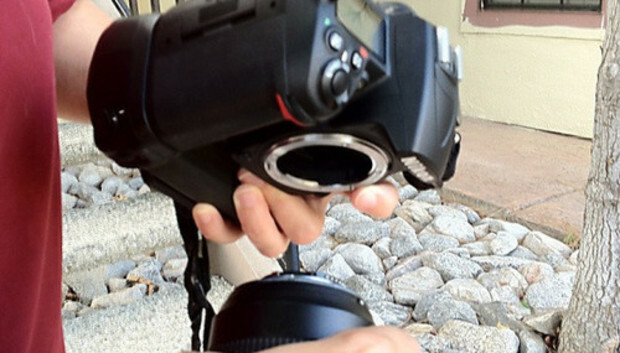 The design of these cameras omits the DSLR's mirror chamber and moves the sensor closer to the back of the lens. The lack of a mirror chamber allows for a smaller camera body, while moving the sensor closer to the lens allows for smaller lens design. All of this means that these cameras and lenses can be made much smaller than those of a traditional DSLR, while delivering the image quality of an SLR and the flexibility of using additional lenses. However, this also means they lack an optical view finder. Some cameras in this category offer an electronic viewfinder instead; others--particularly those at the smaller end of the scale--lack even that and rely completely on the LCD for framing shots. With all of the above factors to consider, it's impossible to recommend the best cameras for everyone. Much depends on budget, size, shooting style, and personal preferences. One more thing: Prices vary wildly so it pays to check a number of camera sellers before making the decision to buy. Meanwhile, check out our updated camera listings for DSLRs and DSLTs. How is the PC not dead yet? News Roundup: Is Palm about to make a comeback?